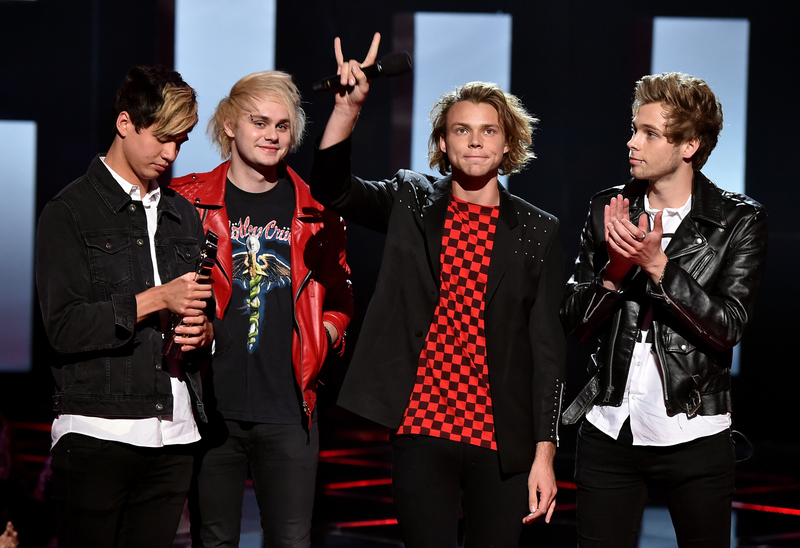 Good news, 5 Seconds Of Summer Fans! Less than a month after the Australian pop-rock quintet dropped their new single, "She's Kinda Hot," Twitter trends let me know that a music video for the addictive track was released on Monday, August 3. After an intent session of watching and re-watching the video, I am pleased to report that the boys of 5SOS have succeeded in releasing a video that is just as delectably nostalgic as the song itself. As Good Charlotte members, Joel and Benji Madden, helped pen the track, it's no wonder that the lyrics and tones of the cheeky single seem to channel some late '90s and early 2000s vibes — one of the many reasons we can't stop listening to it. The video for "She's Kinda Hot" stays true to the song's irreverence with comic-book style animations being catalyzed by a single beat, knock, or expletive. Throughout the video, the boys also seem vexed over both their romantic relationships and pressure of conformity. It becomes undeniably clear by the video's conclusion that there's no keeping 5SOS in a proverbial cage, as they take to the streets of suburbia for an impromptu concert, riding what appears to be a mix between an ice cream truck and a circus ferris wheel — I dig it. Although the video operates at a relatively mellow clip, there are several surprising moments peppered throughout the fabric that may knock you off your chair, bed, kitchen counter, or wherever you choose to watch YouTube videos from. In celebration of the release, let's take a look at nine bizarre moments. Almost immediately, we are treated to some sweet animations. 2. Oh Look, It's A Cat! Check out that purr-fect purple-and-yellow cartoon cat chilling with 5SOS. Like a true gymnast, the cat perfectly (purr-fectly?) lands the dismount in a random kiddie (kitty?) pool. Am I the only one "totally buggin'" over these Clueless threads. There are some shots of Hemmings getting his welding on throughout the video that are eerily similar to the opening scene in XXL. Sadly, the full reenactment never comes to fruition — he just finishes welding or some crud. ...which leads to the best street party suburbia has ever seen. So enjoyable, but so random. Take a gander, yourself, at the colorful new "She's Kinda Hot" from 5SOS by checking out the video below.